3D capture technology has revolutionized all industries and trades. Now, architecture, engineering, and construction (AEC) professionals depend on scan data capabilities to visualize real-life spaces they can interact with digitally, which can improve project collaboration, delivery, and quality. As a leading software for scan data capture, Faro SCENE is a dependable option. However, it is essential for civil engineers to choose the right computer workstation to make the most out of Faro SCENE. Used by AEC professionals, Faro SCENE processes and manages scan data taken on-site from handheld or terrestrial devices. For instance, when surveying outdoor spaces for public development, civil engineers can use SCENE with a Faro-brand or third-party scanner to generate full-color, high-quality data in real time. SCENE utilizes on-site registration, automatic object recognition, scan registration, and automated targetless and target-based scan positioning to create vivid 3D visualizations. Another acclaimed feature of SCENE is the virtual reality view. Once civil engineers have gathered the scan data, they can experience it with VR, providing the project with a whole new level of insight. SCENE is extremely useful for civil engineers because they can export impressive 3D visualizations into workable CAD formats and various point clouds. SCENE is also effective for documentation, as well as measurement taking and mapping, but engineers need CAD and other BIM software to manipulate that data to adjust geometry if, for example, working on an infrastructure renovation project. Having richly detailed scans to work from is crucial but transferring point cloud data from SCENE to another application requires an optimized workstation setting. The optimal hardware configurations for working with dense point clouds (like the type engineers can produce and export with SCENE) require high CPU clock speeds and a substantial number of processor cores so the ideal BOXX workstations include the APEXX S3 featuring an eight-core, Intel® Core™ i7 or i9 professionally overclocked to 5.1GHz, as well as the 18-core APEXX X3, with an Intel® Core™ X-series processor (up to 18 cores at 3.6GHz). Virtual reality is another exciting Faro SCENE feature. Using either the Oculus Rift or HTC Vive glasses, engineers can explore and evaluate remote on-site situations from their offices. With VR, engineers can virtually walk through point cloud data, which allows for an unparalleled, immersive experience. However, VR does place a high demand on computing hardware, and engineers need to make sure their solution stacks up. 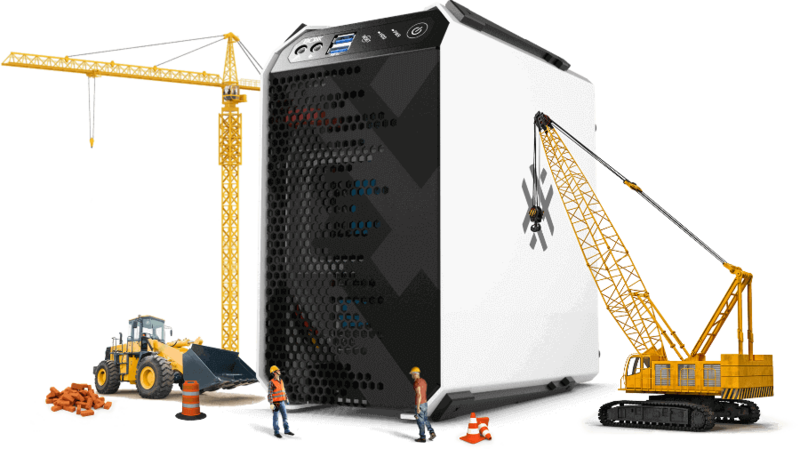 For this workflow, BOXX recommends the APEXX W4 equipped with a 18-core Intel Xeon W processor and including an NVIDIA GeForce GTX 1080 Ti graphics card. Because scan data capture happens in the field, engineers need a mobile workstation optimized for Faro SCENE that can replicate desktop power and performance on-the-go. Considering all the hardware needs for SCENE (high speed, high number of cores, large amount of storage), GoBOXX MXL VR provides engineers with essential computing power. A six core, desktop-class Intel Core i7, NVIDIA® GeForce® GTX graphics, 64 GB of storage, and VR functionality enable engineers to maximize their use of SCENE. Optimized for seamless deployment of incredible VR experiences in entertainment, VFX, product design, and architecture, GoBOXX MXL VR houses a desktop-class 8th generation Intel® 6 Core™ i7 Processor at 3.7 GHz (Turbo Mode up to 4.7 GHz) And, with up to 64GB of DDR4-2400 memory, this mobile powerhouse makes for an amazing desktop replacement. Typically ships in 11 - 13 business days. Please refer to the Ship Date on the emailed receipt upon order completion.